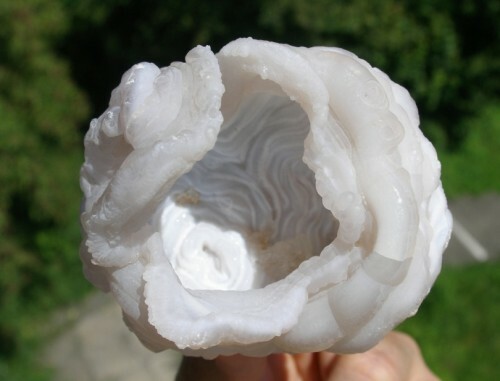 The gorgeous undulating form of white chalcedony quartz crystal is in the shape of a spherical rosette and has alternating bands of opaque pure white and milky translucent quartz chalcedony with a luscious pink undertone that simply glows. CHALCEDONY is a member of the quartz family. It’s transparent, translucent, or opaque. 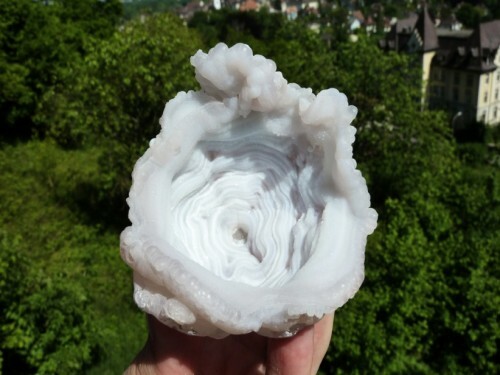 It occurs as stalactites, in botryoidal form, and in the lining of cavities of rocks. It occasionally contains a small amount of opal. It was used as a sacred stone by the Native American Indians, promoting stability within the ceremonial activities of the tribes. It has successfully been used to provide a pathway for receiving thought transmissions. CHALCEDONY is useful for balancing the energy of the body, mind, emotions and spirit. It is a stone to encourage “brotherhood” among all. It symbolized benevolence and good will stemming from the nurturing energy within the stone. It alleviates hostilities, irritability, and melancholy. It enhances generosity, responsiveness and receptivity. It is a stone of the mind, as well as angelic stone. It is said to bring mental ability and clarity, as well as perception of all kinds, including intuitive perception. Desert rose is used in crystal healing to quiet worries and still the mind from distractions and disruptions. Metaphysically, desert rose is used to dissolve "programs" we have put upon ourselves that are outdated or over-used. It is helpful for strength in meditation and affirmation.